Accurate evaporation prediction is significant for the management of water resources systems. The advantage of empirical formulas is that they don’t require a lot of parameters. In this study, evaporation values of meteorological stations located in Konya Closed Basin and basin-wide evaporation values are predicted with the developed empirical formulas (DEF). The formula is formed by adding the mean temperature term to Meyer empirical formula (MEF) and the coefficients are determined by linear regression analysis. For this purpose, 70% of mean monthly water vapour pressure in air, relative humidity, wind speed, temperature and evaporation values of Cihanbeyli, Niğde, Beyşehir, Aksaray and Karaman meteorological stations located in the basin between 1978 and 2017 were used for modelling stage and 30% for test stage. The results obtained from the DEFs were compared with the results obtained from MEF via determination coefficient. Konya Closed Basin, in where Beyşehir and Salt Lakes are located, is an important ecological area. Evaporation prediction in the basin, where severe droughts are experienced, is important for the management of water resources systems. It was determined that the determination coefficients obtained from the DEFs were higher than the determination coefficients obtained from MEF at both the training and the test stages. These results show that the DEFs gave better results than MEF and they can be used for evaporation prediction in the places where evaporation values are not measured or contain missing data. A. M. Sturrock, T. C. Winter and D. O. Rosenberry, “Energy budget evaporation from Williams lake-a closed lake in North Central Minnesota,’’ Water Resour. Res., vol. 28, no. 6, pp.1605-1617, 1992. L. A. Sacks, T. M. Lee and M. J. Radell, “Comparison of energy-budget evaporation losses from two morphometrically different Florida seepage lakes,’’ Journal of Hydrology, vol. 156, no (1-4), pp. 311-334, 1994. H. H. G. Savenije, “Determination of evaporation from a catchment water balance at a monthly time scale,’’ Hydrology and Earth System Sciences, vol. 1, no. 1, pp. 93-100, 1997. R. J. Reis and N. L. Dias, “Multi-season lake evaporation: energy budget estimates and CRLE model assessment with limited meteorological observations,’’ Journal of Hydrology, vol. 208, no. (3-4), pp. 135-147, 1998. J. J. Gibson, “Short-term evaporation and water budget comparisons in shallow Arctic lakes using non-steady isotope mass balance,’’ Journal of Hydrology, vol. 264, no. (1-4), pp 242-261, 2002. T. C. Winter, “Evaporation determined by the energy budget method for Mirror Lake, New Hampshire,’’ Limnol. Oceanogr., vol. 48, no. 3, pp. 995-1009, 2003. H. Liu, Q. Zhang and G. Dowler, “Environmental controls on the surface energy budget over a large southern inland water in the United States: an analysis of one-year eddy covariance flux data,’’ J. Hydrometeorol., vol. 13, no. 6, pp. 1893-1910, 2012. Q. Zhang and H. Liu, “Interannual variability in the surface energy budget and evaporation over a large southern inland water in the United States,’’ J. Geophys. Res. Atmos., vol. 118, no.10, pp. 4290–4302, 2013. R. Choudhary and J.B. Klauda, “The simultaneous mass and energy evaporation (SM2E) model,’’ J Occup Environ Hyg., vol. 13, no.4, pp. 243-253, 2016. K. Saravanakumar, S.Gokul A.R. Palanivelrajan and S. Surendran, “Determination of mass transfer coefficient for evaporation water from surface of swimming pool and amount of water loss per day,’’ International Journal for Scientific Research & Development, vol. 4, no. 12, pp. 14-151, 2017. Z. Duan and W.G.M. Bastiaanssen, “Evaluation of three energy balance-based evaporation models for estimating monthly evaporation for five lakes using derived heat storage changes from a hysteresis model,’’ Environmental Research Letters, vol. 12, no. 2, pp. 1-13, 2017. M.Q. Brewster, “Evaporation of water at high mass-transfer rates by natural convection air flow with application to spent-fuel pools,’’ International Journal of Heat and Mass Transfer, vol. 116, pp. 703-714, 2018. K.P. Sudheer, A.K. Gosain, D.M. Rangan and S.M. Saheb, “Modelling evaporation using an artificial neural network algorithm,’’ Hydrological Processes, vol. 16, no.16, pp. 3189-3202, 2002. E. Doğan, S. Işık and M. Sandalcı, “Günlük Buharlaşmanın Yapay Sinir Ağları Kullanarak Tahmin Edilmesi,’’ İMO Teknik Dergi, vol. 18, no.2, pp. 4119-4131, 2007. S.S. Eslamian, S.A. Gohari, M. Biabanaki and R. Malekian, “Estimation of Monthly Pan Evaporation Using Artificial Neural Networks and Support Vector Machines,’’ Journal of Applied Sciences, vol. 8, no.19, pp. 3497-3502, 2008. A. Moghaddamnia, “Evaporation estimation using artificial neural networks and adaptive neuro-fuzzy inference system techniques,’’ Advances in Water Resources, vol. 32, no. 1, pp. 88-97, 2009. F.-J. Chang, L.-C. Chang, H.-S. Kao and G.-R. Wu, “Assessing the effort of meteorological variables for evaporation estimation by self-organizing map neural network,’’ Journal of Hydrology, vol. 384, no. (1-2), pp. 118–129, 2010. J. Shiri, W. Dierickx, A. Pour-Ali Baba, S. Neamati and M.A. Ghorbani, “Estimating daily pan evaporation from climatic data of the State of Illinois, USA using adaptive neuro-fuzzy inference system (ANFIS) and artificial neural network (ANN),’’ Hydrology Research, vol. 42, no.6, pp. 491-502, 2011. P. Kumar, D. Kumar Jaipaul and A.K. Tiwari, “Evaporation estimation using artificial neural networks and adaptive Neuro-Fuzzy inference system techniques,’’ Pakistan Journal of Meteorology, vol. 8, no. 16, pp. 81–88, 2012. 20] F.-J. Chang and W. Sun, “Modeling regional evaporation through ANFIS incorporated solely with remote sensing data,’’ Hydrology and Earth System Sciences Discussions, vol. 10, no. 5, pp. 6153-6192, 2013. M.K. Goyal, B. Bharti, J. Quilty, J. Adamowsk and A. Pandey, “Modeling of daily pan evaporation in sub tropical climates using ANN, LS-SVR, Fuzzy Logic, and ANFIS,’’ Expert Systems with Applications, vol. 41, no.11, pp. 5267–5276, 2014. A. Javed and S. Sakshi, “Evaporation Modelling by using Artificial Neural Network and Multiple Linear Regression Technique,’’ International Journal of Agricultural and Food Science, vol. 5, no.4, pp. 125-133, 2015. S. Sajeena, V. Amrutha Gayathry and V.K. Sharmina, “Estimation of Pan Evaporation Using Artificial Neural Networks – A Case Study,’’ International Journal of Current Microbiology and Applied Sciences, vol. 6, no. 9, pp. 3052-3065, 2017. S. Tamta, P.S. Kashyap and P. Kumar, “Estimation of Evaporation in Hilly Area by Using Ann and Canfis System Based Models,’’ International Journal of Current Microbiology and Applied Sciences, vol. 7, no. 1, pp. 911-919, 2018. U. Okkan, Z.A. Serbeş and H.Y. Yıldırım, “Yapay Sinir Ağları ve Ampirik Yöntemler ile Aylık Tava Buharlaşmalarının Tahmini,’’ Devlet Su İşleri Teknik Bülteni, vol. 111, pp. 7-16, 2011. G. Tezel and M. Büyükyıldız, “Monthly evaporation forecasting using artificial neural networks and support vector machines,’’ Theoretical and Applied Climatology, vol. 124, no. (1-2), pp. 69-80, 2016. D. Selim, “Konya Kapalı Havzası kuraklık karakterizasyonunun zamansal-konumsal analizi,’’ Doktora Tezi, Selçuk Üniversitesi, Konya, 2013. S. Dogan, A. Berktay and V.P. Singh, “Comparison of multi-monthly rainfall based drought severity indices, with application to semi-arid Konya Closed Basin,’’ Turkey, Journal of Hydrology, vol. 470, pp. 255-268,2012. M. Bayazıt, Hidroloji, İstanbul, Birsen Yayınevi, 2003. ISNAD ARSLAN, ONUR . "Prediction of Evaporation Values of Konya Closed Basin via Developed Empirical Formula". 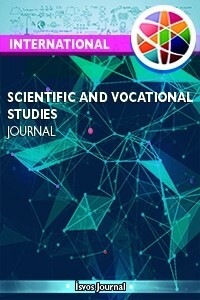 International Scientific and Vocational Studies Journal 2 / 1 (June 2018): 29-38.